Are you a hunter looking to take down a longbeard this season? One of the most important things a hunter can do is learn as much as possible about your prey, including where they sleep. Wild turkeys are no different and learning their habits in combination with your hunting skills and strengths will arm you with all the information necessary for you to bring home the bird. Turkeys are often seen wandering along the ground. I can't count the number of times I have had to stop my car and wait for a posse to pass. But these birds can fly and though in short bursts, they can reach speeds of 55 miles per hour! 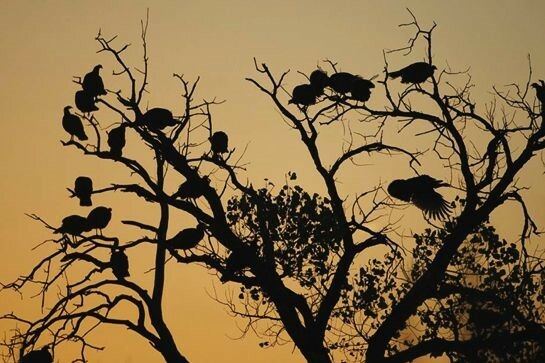 That said, it is no surprise that you can find these birds flying up into trees at nightfall for a little shut eye. Wild turkeys take to the trees at night to stay safely out the range of predators that might want to attack while the birds are asleep. The list of predators that turkeys defend themselves from is a long one, including raccoons, coyotes, foxes, snakes, skunks and even dogs. When birds wake up around dawn, they call out softly to their posse to make sure all is well before descending from their perch. As you probably already know, turkeys have excellent eyesight. While they can see great during the day and low light (think twilight and dawn), they cannot see well in pitch black. In fact, with some good hunting skills, you could find yourself settled under their roosting tree undetected with a perfect vantage for an early dawn hunt. How can this information help you, the hunter? Aside from knowing as much as possible about your prey, hunters need tools to hide themselves from being noticed by these birds. The turkey's eyesight is ten times better than humans so even though we know where they sleep, once they are awake, they have the advantage. Setting up your blind in an area you know turkeys tend to sleep in is a great idea, especially if you do it well in advance. While blinds are highly recommended for blurring your silhouette to your prey, check out this incredible video where hunters did it all without a blind. Decoys can be hit or miss but it never hurts to try and bring the birds into closer range, increasing your chances of a direct hit. Keep in mind the keen eyesight of these birds as they do rely on each other as well. In a posse, you could have upwards of a dozen eyes looking out for your hiding spot. Let's look at some key common sense guidelines to follow while hunting longbeards will help you tag the bird you so desire. Scouting is a necessary action and there is no such thing as doing too much. Once you uncover where your prey sleeps, set up your blind near the cozy copse of trees. Be sure light doesn't angle into it and blend in with your surroundings as much as possible. Use decoys even if they are hit or miss. You know where the turkeys sleep, so now plant those decoys at a relative distance from your blind and their nesting place. These jake ﻿﻿and hen decoy﻿﻿s from Amazon are the perfect size for your hunt. Learn how to do mouth calls because holding a bow doesn't allow for you to use your hands. In combination with scouting, using the calls will draw the turkeys to your decoys which make for an easy shoot. When practicing for turkeys, mimic hunting conditions as best as you can to make the transition from practice to the real thing seamless. One key to tie this all in together is proper planning and patience. With good scouting and planning, you can find yourself in the situation we described earlier where you find yourself surrounded in close proximity to wild turkeys prime for your shooting. A good hunter does the prep work needed for success. 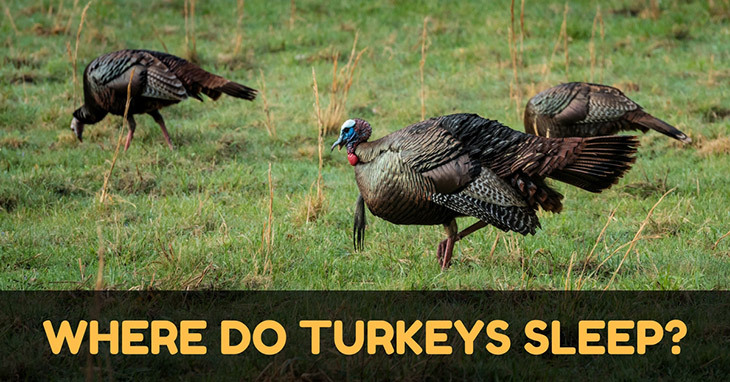 Knowing where turkeys sleep is one piece of a plethora of information. Understanding your prey, their habits and how best to leverage this information is like fitting all the pieces of a puzzle together, one that hopefully lands you a turkey in the oven. Bought a new gobbler and it begins fighting, so I put it in cow pasture, you can’t put two males together? You can put a tom (adult male) and a jake (juvenile male) facing each other as if they are establishing the pecking order. This may attract a battle-ready gobbler into range.